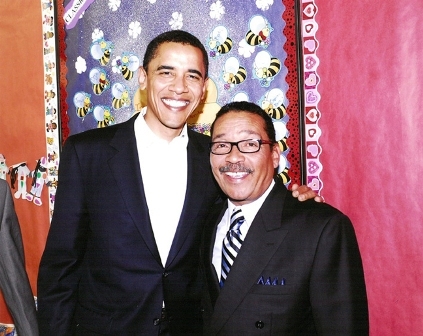 Los Angeles City Council President Herb Wesson announced plans on Tuesday to expand the innovative Destination Crenshaw Project celebrating African American culture north to Obama Boulevard from its current terminus at West Vernon Avenue. Wesson’s legislation calls for plans to be developed to engage Destination Crenshaw, the non-profit organization spearheading the project, in the necessary visioning, planning, and design studies that would be required to extend and expand this important cultural project. The motion was seconded by Marqueece Harris-Dawson, the Councilmember from Council District 8, whose district houses the current plan, and will be voted on by the full Council next week. If passed, the Council President’s motion would nearly double the length of the plan. Currently the project is planned to run for 1.3 miles, flanking the Crenshaw Boulevard corridor of the new Crenshaw/LAX Line through Hyde Park. The Destination Crenshaw project is a community-inspired open air art and cultural experience, designed to be a living celebration of world class contributions of Los Angeles’ African-American community. Brought to life by Council­member Harris-Dawson, the project will use Crenshaw Boulevard as a backdrop for this innovative project which honors and celebrates the cultural, social, and political contributions of the City’s African American community. As Harlem was once the center of the Black art and culture, today South Los Angeles stands proudly as the leader. The community’s distinctive vision for Destination Crenshaw enjoys broad public and private support and plans are under way to unveil the completed art and cultural experience in Spring 2020.